I invited Ann Featherstone, Victorian theatre researcher and novelist, to write a guest post on penny gaffs (partly in response to the ‘Beggar’s theatre’ post – see September 2014 archive). Here it is! Penny gaffs, penny theatres, penny dukeys, geggies were all slang words for unlicensed entertainment spaces in the first half of 19th century, although the term lingered on into the 1950s. Like all slang words, it often meant what the user wanted it to mean. It usually disparaged the quality of a theatre or hall or the quality of acting; it presupposed that everyone knew what it meant. The Era, that upholder of theatrical tradition, never used the word gaff, but always referred to a ‘penny theatre’ or an ‘unlicensed theatre’. Whatever, the penny theatre was understood. It was a performance space, often ‘found’, and it provided cheap, very cheap, entertainment. And it was not licensed. Gaffs proliferated during the 1830s in response to the high prices charged by the patent and minor theatres in major cities. Unlicensed, unpoliced and, thus, outside the law, they were a working class response to the restrictions which made the spoken word the prerogative of those who could afford it. Repression, suppression and confusion followed as legislators, magistrates and police attempted to negotiate the complexities of an unworkable law. The Stage Licensing Act (1737) was the rule of thumb. Under this law, the entire company (16 people) of a penny theatre in Short’s Gardens, St Giles, was arrested as rogues and vagabonds. During this period, most complaints about penny theatres which reached the courts were as a result of summonses for nuisance – noise, rowdy behaviour – or being the scene of brawling, thieving and runaway children. But concerns about the ‘immoral tendency and depraving effects’ of the theatres continued and when, in 1839, the Metropolitan Police Act was introduced to extend the powers of London’s police force to cover a multitude of potential ‘nuisances’, the penny shows were ripe targets. 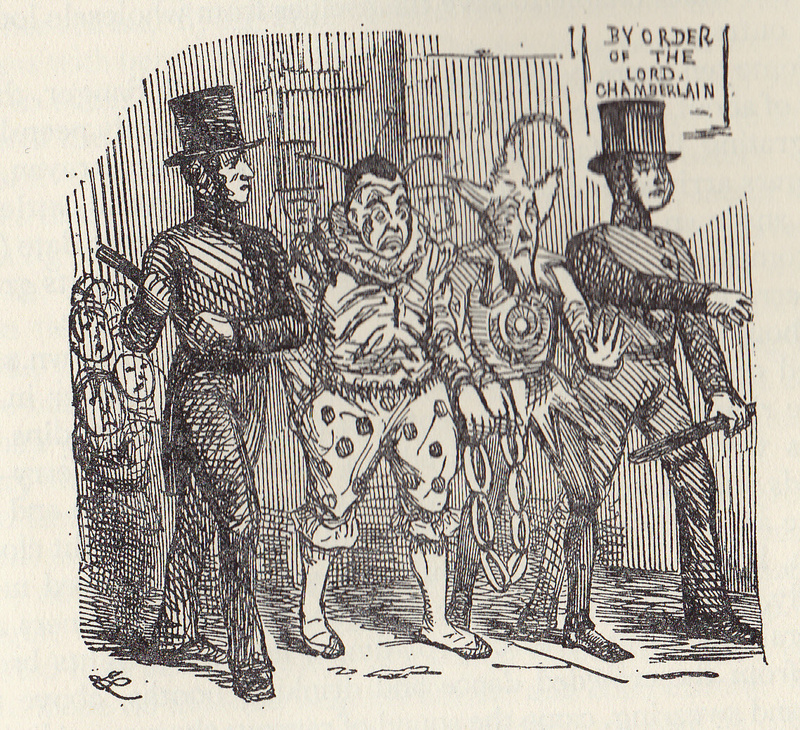 The police were given the power, to ‘enter into any House or Room kept or used within the said District for Stageplays or Dramatic Entertainments into which Admission is obtained by Payment of Money, and which is not a licensed Theatre,’ and once there, they could take everyone into custody, performers and spectators alike. Hayden’s penny theatre in Holborn was the first to be made an example of with, perhaps deliberately, the spectacle of the company parade through the streets to court in the stage costumes in which they had been arrested. Various Acts of Parliament followed in an attempt to make sense of it. The Police Act saw a rise in the number of police raids but little diminution in the number of penny gaffs. The Theatres Act of 1843 clarified the legal position in some ways but complicated it again in others. Under this act, the theatre building had to be licensed in order for stage plays of any kind to be performed, but then another knotty question arose – what constituted a stage play? Till I heard visited it, I had never suspected the existence of a society for theatrical entertainment where all imitation is cast to the winds, and originality is fearlessly pursued; their own dramatists reflecting the manners and customs of their own class on their own stage, to their own kith and kin, their ambition, only to please – their thoughts never bent on other reward. Maybe the question we should ask about the gaffs is not what was performed there, but how.